Both my parents were employed on a farm, so from a very young age I was exposed to the elements of mother earth. Potato picking season with my mother was an adventure, as I played in the fields and played my part in collecting potatoes into a bucket. (If you can call it that). That was when I first got my hands covered in mud and enjoyed every minute of it. Working on farms was something I did right through my school years. As soon as I got home I would have my tea, do any homework and then go to the farm to carry out some sort of duties depending on the season. I did this until the age of sixteen, when I started an engineering apprenticeship and my passion of mechanics also progress to the next level. I would work at the factory during the day, and at evenings would be repairing cars until about eleven at night. At the age of twenty-three I had enough of factory life, and I had a chance to go into partnership to run our own garage. This lasted for about three years, while building up a very large loyal client base, but then I decided to leave for a new challenge. The next few years I was involved in the haulage transport section, travelling all round the country side until the death of my mother. I then lost the motivation to carry on what I was doing and didn’t enjoy it any longer. After having a couple of weeks off, I was offered some groundwork of installing drives and patios which I jumped at. I took to it like a duck to water and in no time I was managing the projects. We also took on a new product that was introduced from New Zealand called pattern imprinted concrete. We were so good at it that we were training other franchise personnel how to do it for the main company. This was how I ended up in Canada with my girlfriend at the time Sandra, teaching the Canadians how to lay pattern imprinted concrete. We were out there for the permitted six months before coming back to the UK. We had the intention of going back as we had our sponsor (A cousin of president Bush) and new company all set out. Due to several factors including Sandra becoming pregnant we decided we would stay in the UK and we got married soon after. I got a job working for a petroleum company doing maintenance and building work for all their service stations. I saved them an absolute fortune from them not having to employ outside contractors. After a certain time, that had been agreed in advance, a review was held. Of course, I wanted a wage rise to reflect on how much I was saving the company but unfortunately, they disagreed saying that I would be on more money than some of their directors. Long story short, I decided to leave, although they did increase their offer two times to try and keep me, but by that time, I had made up my mind to leave. I discussed it with my wife and decided that we would start our own company doing all the jobs I enjoyed. This is how A-Z Landscapes was born. 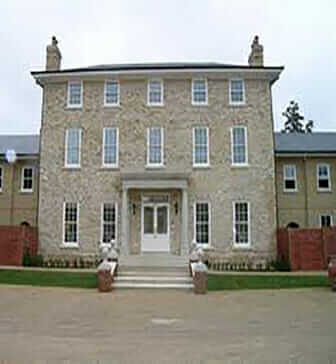 “Ted and his team have been maintaining our premises for over 20 years to the high standard that we require of our grounds to give the correct image for our company to our retained and new clients. Nothing has ever been to much trouble for them and they have always reacted to our requests in a manner that we ourselves are accustomed to”. Some of you might have noticed that our full name is a lot longer than just A-Z landscapes. Let me tell you the reason for that. When we first started it was just a partnership between myself and my wife and it was called A-Z landscapes. After a few years my father in law Don, wanted a change of work from being a plumber all his working life. Now a lot of you might be thinking plumbing isn’t anything like landscaping? This is where you are wrong, as when Don was an apprentice he had to know a lot more trades than just plumbing. Groundworks, brick laying, carpentry, tiling, electrics, concreting and a lot more besides. So, as you can see a lot of these trades do in fact blend themselves in nicely with landscaping. Now the one problem we had, was most of our customers at the time were in the domestic market and not commercial, and we were just under the VAT registered threshold. If Don joined us we knew that we would have to get VAT registered and would probably lose customers as they would not want to pay the VAT. To get over this we decided to form another company called A-Z Contract Services with Don and myself being partners in this business but running side by side with A-Z Landscapes but this part running on the commercial side. In the coming years this worked out well, as we gained more commercial contracts until sadly my father in-law died of cancer. Although doing this had been a nightmare for our accountant, it had worked and kept us under the VAT limit in both businesses. As we had built up our commercial side, we said the easiest thing to do would to merge the companies together, get VAT registered and also become a ltd company. 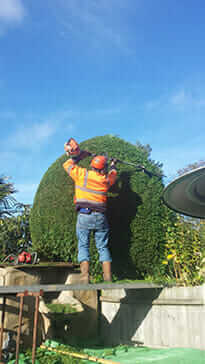 This is how A-Z landscapes & Contract Services Ltd came into existence. P.S. It’s funny because we didn’t lose any of our domestic customers and it made it a lot easier to deal with commercial businesses as they were used to and expected invoices to have VAT on them. As we have mentioned before, this is a family run company and we now have the pleasure of our son in-law joining the business to carry on the family tradition. He has always been interested in landscaping and from a very young age use to earn his pocket money by tending other people’s gardens. Even when he was employed as a shop manager and a pre school teacher he found time to keep up with looking after people’s gardens. When he decided he wanted to be full time doing landscaping he discussed starting up his own business. This is when we sat down and had a discussion of what he wanted to get out of it and where he wanted to go with it. This was when he said he would like to join the company and eventually take it over (the joys of getting old). You know the answer to this question already, as he has now joined the company and is learning the parts of the trade that makes a company, not just good but great at what they do. We call it old school. That means giving the customer what they want to a specification and the quality they expect for a fair price. © 2018 AZLandscapes.co.uk - All Rights Reserved. 01. 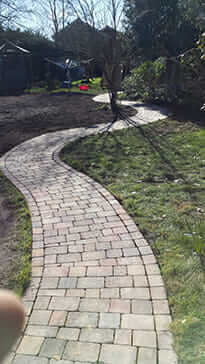 Block paving and concrete drives. 02. Tarmac and stone drives. 04. Brick and railway sleeper walls. © 2017 AZLandscapes.co.uk - All Rights Reserved.